Tea sets are some of the most common, and desired of the Antique Silver collectables. Silver Tea Sets started becoming common in the 18th century and often took the "bullet form" style. Antique Silver Tea Sets can have great value beyond their basic Silver Value as they can be beautifully decorative and add a wonderful elegance to any home. Are you having a vintage silver tea set that you would like to sell because you really have no use for it or simply cannot maintain it? Look into our store and get cash value that is a true reflection of its quality. We are authorized silver tea set buyers and will check the value of your tea set based on various factors to determine at a fair price. We buy them such items for auction and resale and do not make use of the silver for other purposes. Hence by selling to us, you will be putting a precious heirloom into the hands of the right people, who will maintain it very well and give it off to a buyer who respect its real value. A fabulous vintage silver tea set comes with many pieces such as a one or two pitchers, a cream bowl, a sugar bowl and also a waste bowl. It has ornate carvings which bring out the beauty of the silver metal. When polished, pieces of the set simply gleam in the sunlight. A well-maintained silver tea set will fetch you a nice price, giving good cash in return. 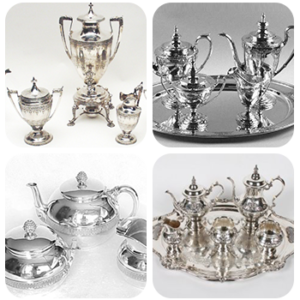 You can get the best price for your antique silver tea set from us as we determine silver tea sets value by looking into various factors such as year of manufacture, quantity of silver used in it, detailing work etc. Even if your tea set is not in such a good condition, don’t worry, we will offer a fair price, after examining it in detail. 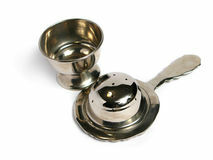 While Sterling Silver Tea Sets do exist and can be quite valuable, and can be identified with such Silver Marks as "925" (indicating 92.5% pure silver) or lion passant for genuine English silver, many Antique Silver Tea Sets are made with Sheffield Silver, which describes an English silver plating technique developed in the 1740s. However, despite being silver plated, or hollowware, these pieces can still be quite valuable. What's The Value Of My Silver Tea Set? There are many factors which are considered and can greatly increase the value of your silver tea set. Desirably and uniqueness of design. Most Antique Silver Tea Sets have little to no historical value. However, consulting an expert is the best way of determining this for your tea set. This also means that the first three factors are of great importance. As most silver tea sets were made with very thin sheets of silver and were prone to small holes or damage, it's best to take a look to see if any repairs were made. The Completeness of your tea set will also play a big factor on determining it's value. A basic set will often include 3 pieces or more including: the tea pot, sugar bowl, creamer, waste bowl, coffee pot, tray, and so on. The more pieces, and the condition they're in, the better. How can we help you discover what you've truly got?, we love to help people find the true value of their Antiques. Our appraisals are 100% accurate and we offer the very best price for any antiques that we purchase for Instant Cash. Get your FREE verbal, no obligation appraisal!